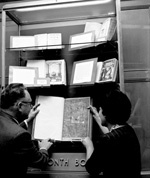 Stanley West, director of library, and Laura Monti, librarian, hold Millionth Volume. Scanned. No deterioration. West, director of library, and Monti, librarian, hold Millionth Volume. Photograph 4012 from the University Archives Photograph Collection.